Having fun with strings, I found three different macros to loop over a string character by character. However, I am not very sure how they work exactly. Can somebody explain the mechanism of each of them? Which is the most "correct" one? Is there some other way to construct this macro? I have changed the original ones so that they all look as similar as possible. This is the easiest one to understand for me. Since the arguments are delimited, the first one is the first letter and the rest is reintroduced into the loop. The looping works from within the \if statement. This one is trickier. The looping comes from inside the \if statement, but not really. If the \expandafter is eliminated, it does not work. If the \xloop is placed behind the \fi it does not work either. So what is happening exactly? The rest is easier, every time \xloop is executed, it finds the remaining part of the string and takes the first character. This one is still more complicated (for me, at least). The looping works from outside the \if statement, but the characters are accessed one by one as before. Surprisingly, here the spaces are not discarded. This can be achieved also in the previous macros with \obeyspaces. Here you see that the macro uses a delimited argument so the entire list is grabbed each time (all tokens up to > ) and the first token is handled, with the remaining tokens being re-inserted in the recursive call. as #1 works as a normal non-delimited argument it always drops spaces. At each stage there is a \fi inserted after the loop so if you have 1000 entries there will be 1000 of these, and at some point you will over-fill the input stack. Here you can see that after the first macro the inner macro does not grab the whole list, but just the first token. Doing it this way avoids reparsing teh list, and overloading the input stack, but you need to expand the \fi (to nothing) before doing the recursive call as you do not have the possibility of putting the \fi after the list as in the first version. hence the \expandafter which forces \fi to expand before \xloop. Here the item is grabbed by a \let assignment, this has the advantage of seeing space tokens, but as it does not work by expansion it fails in the \typeout. There are two differences between the first solution and the other two: The second and third solution both use tail recursion, in contrast to the first one. And, related to this, the first solution has to copy the argument from iteration to iteration, while the other two solutions pass over the argument just once, processing character by character without copying the rest. Note how the \fis pile up at the end. Second solution. This is the most compact one. The \expandafter changes the order of expansions: \fi is expanded first, so the \ifx gets finished before continuing with the next \xloop. Third solution. \afterassignment first "assigns" the next character to a macro before testing it. Tail recursion is obtained by letting \next point to the code that is to be executed after the closing \fi. which is the non-expandable rest. 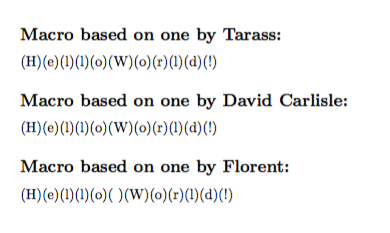 The solutions by Tarass and David Carlisle are not that different. The latter is more efficient, because it removes the conditional before going to the next cycle, whereas the former nests them and, at each cycle, a \fi is added to the stack: a (very) long string could cause memory overflow. The other difference, that is, the delimiters <>, is irrelevant as they play no role whatsoever. Ignoring spaces is the price to pay for expandability of the macro: this means that the result is “computed” directly by macro expansion. The third solution uses a different approach: instead of absorbing the next item as the argument to a macro, which is the cause for space gobbling, the control sequence is let to the next item, which is then removed, until arriving at \relax. Note that you can't use this for storing the processed token list, because all cycles use \xchar for printing the item. Spaces are first replaced with \textvisiblespace (you can use \nonbreakingspace if you prefer). If the optional argument is missing, the processed string is printed, otherwise it is stored in the macro given as argument (no check for it not being defined is performed, but it can be easily added). Here's a simplified version, just for printing the result. As you see, the code is much shorter and each command does a well stated task. It does exactly the same as Florent's code. Not the answer you're looking for? Browse other questions tagged macros loops strings or ask your own question. LuaLaTeX: How to use a \char directive inside a string.gsub function?